Purulia: A child was found with a sword in a Bajrang Dal rally in Purulia's Goushala on Saturday. The Bajrang Dal is organising a shobhayatra (procession) on the eve of Ram Navami. Thousands of devotees thronged to this roadshow. It's election time and the BJP seized the opportunity to use this platform. BJP candidate Jyotirmay Singh Mahato and district president Vidyasagar Chakraborty were present in the shobhayatra. Like earlier years, the police did not impose any restriction. The shobhayatra went off peacefully. Women in large numbers were present in the rally. On the other hand, Trinamool this time is arranging a rally on Sunday to cash in on the Hindu vote bank before the election. A party source said, "This time, Trinamool is not ready to leave any room for the BJP to use the occasion of Ram Navami for political ends." 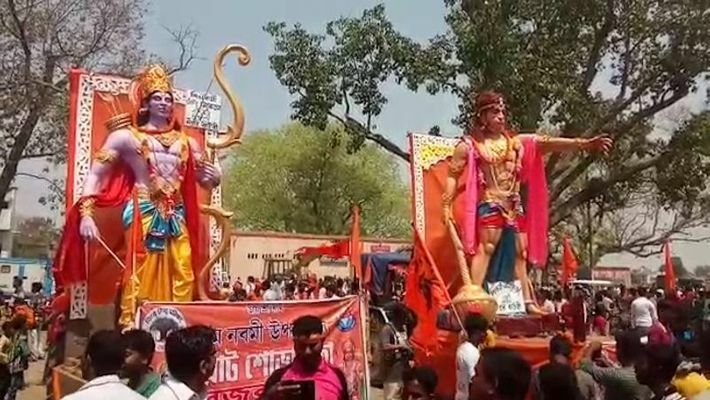 Ram Krishna Chakraborty, the VHP district president, while speaking to the media, said, "We have been taking out shobhayatras on the eve of Ram Navami for the last three years. This shobhayatra starts from the Goushala crossing. After passing through the entire town, it ends at the taxi stand." Asked about a child carrying a sword in the procession, the VHP leader said, "I have made an announcement that the procession will be totally weapon-free. But I have not seen any weapon till now. We have asked the police to bring before us anybody found with weapons. We will remove him from the rally. If anyone has brought any such weapon, like in other years, the VHP is not responsible for that."